We all have those things that we keep telling ourselves we must do right? I’m not talking mowing the lawn here, but rather fun things. Exciting things that grab your attention. Well a few weekends ago the heat wave was so oppressive it was getting to us all, even the goldfish was looking for the ice bucket, then like a bolt from above I thought … waterpark! You don’t often see it advertised, actually I can’t remember ever seeing an ad for it, but anybody heading out along Junction Drive Coolum would have passed it and thought, ‘We must do that one-day’. I am of course talking about Blast Aqua Park. It’s so easy to get to as it’s just off the highway and it sort of reminds me of that Ninja Warrior show you see on TV. 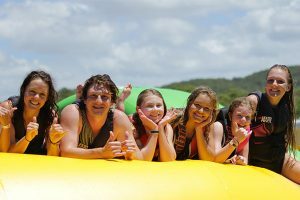 Slides, jumping pillows, trampolines, swings, running tracks, balance beams, wobble pads – so many challenges that offer even more chances of you ending up in the drink. 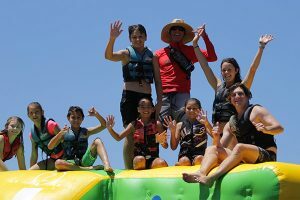 Think of any inflatable device that would be fun to play around on in the water and you find it on the park’s freshwater man-made lake. But don’t let the colour phase you if you’re not a local – we understand that like most fresh water lakes on the coast the water is coloured by the local tea tree oil from within the natural flora surrounding the park. So yes it’s fresh and clean. And the best bit, being a fresh water lake there’s no pesky sharks to worry about. We went for the 2 fifty minute sessions and had a ball. As did everyone else we saw there. There was an elderly couple reliving their youth who seemed to be getting more than their monies worth. It’s suitable for ages from about 6 years up but the younger ones do need to be with an adult. They are very safety conscious and in fact have a briefing prior to letting you loose on the water. 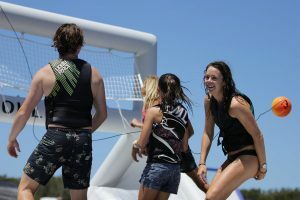 Those not keen on getting amongst it in the water can watch from the sidelines for free and chill out in the shade and watch the fun unfold. There are also free BBQ areas, picnic benches and some sun loungers but it’s a first come scenario. A new café with good coffee and a kiosk has recently been added for those who prefer not to lug the esky in and out. You’ve got to be organised so that you arrive at least 30 minutes prior to your preferred time to get your tickets sorted, the signing in process and the safety briefing. And they’re pretty strict in not allowing people to join a session after it has begun. I also noticed that the park caters for party groups, so if you’ve got a team break-up or celebration you can book for groups large or small. On the way home in the car we decided to put together a ‘things and events’ bucket list, to make sure that we take advantage of all of things that you can do on the Sunshine Coast. If you’d like to get all the info on the Blast Aqua Park check out their website. Let’s do the Time Warp Again – It’s Festival Time Folks!